I love snack bars and I probably eat one every day. In my opinion it is one of the quickest, easiest way to pack a snack for work or school. Most of the ones that I've found have been glorified candy bars loaded with sugar and fat. I wanted a decent tasting high fiber bar, especially since I don't usually have time to eat my fiber one cereal every morning. Fiber One Chewy Bars, I tried Oats and chocolate. This was the first bar I purchased and I like the taste but they were a little too chewy for my preference. Each box contains 5 bars. Each Bar contains 140 calories, 4 grams of fat, and an impressive 9 grams of fiber. The bar also contains 10 grams sugar and 29 grams of total carbohydrate (2 exchanges for diabetics). Quaker Fiber & Omega 3 Bars, I tried Peanut Butter Chocolate. This was my least favorite bar, it tasted okay but it was really dry in my opinion. If you have ever made rice krispy treats and tasted them a couple days after they were made...it's kind of like that. The main ingredient is granola so maybe that's why it was more dense than the other two. Each box contains 5 bars and each bar contains 150 calories and 5 grams of fat. It contains 9 grams of fiber, 7 grams of sugar, and 25 grams of total carbohydrate (2 exchanges for diabetics). 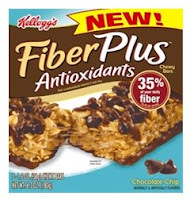 Kellogg's Fiber Plus Antioxidant Chewy Bars, I tried Chocolate Chip. These are by far my favorite snack bar and over the years I've tried A LOT of them. These are delicious, they almost taste like the Samoa Girlscout cookies without the coconut (and the fat). I bought two boxes and each one had a coupon on the back, I will definitely be repurchasing! Each box has 5 bars and each bar contains 120 calories and 4 grams of fat. The bars also have 9 grams of fiber, 7 grams of sugar and 26 grams of total carbohydrate (2 carbohydrate exchanges for diabetics). 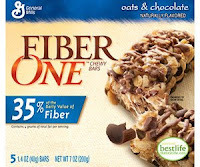 I will finish eating the remainder of the Fiber One and the Quaker bars but I will probably buy the Fiber Plus from now on. They have less calories and a better taste in my opinion. I would like to make it clear that the other bars are tasty, I think all three companies did a great job making fiber more delicious. All of the boxes were bought on sale or with coupons so I'm unsure of the actual retail price but I'm guessing in the $2-$4 range.